"Office referrals have reduced from 351 last year to 118 currently for the same period (66 percent reduction). Comparing the same years, discipline entries decreased 63 percent (2413 to 881)." 82% of students qualify for the Free/Reduced Lunch Program. Over the course of one year with START on Time! 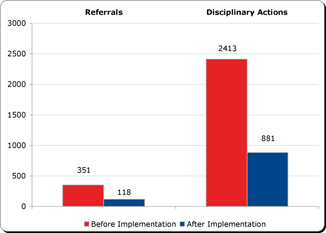 students at Hill Middle School have reduced office referrals by 66% and decreased discipline entries by 63%!